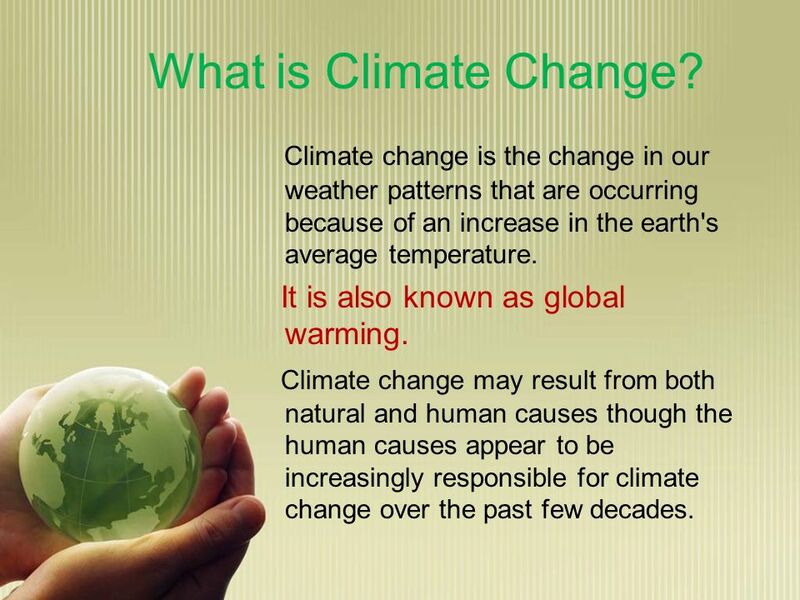 2 What is Climate Change? Climate change is the change in our weather patterns that are occurring because of an increase in the earth's average temperature. It is also known as global warming. Climate change may result from both natural and human causes though the human causes appear to be increasingly responsible for climate change over the past few decades. 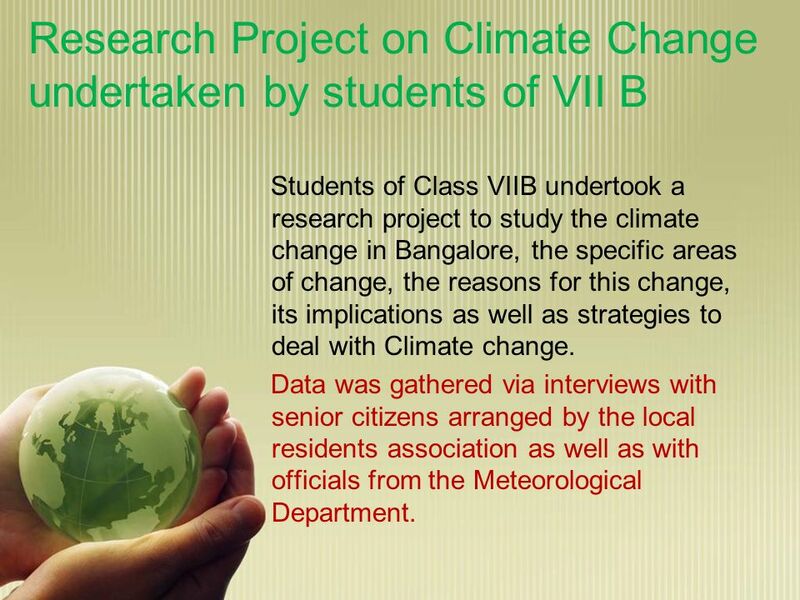 3 Research Project on Climate Change undertaken by students of VII B Students of Class VIIB undertook a research project to study the climate change in Bangalore, the specific areas of change, the reasons for this change, its implications as well as strategies to deal with Climate change. Data was gathered via interviews with senior citizens arranged by the local residents association as well as with officials from the Meteorological Department. 4 Key Research Findings The citys monthly mean maximum temperature has been steadily on the rise. It has increased by two to three degree Celsius since 1960. The highest maximum temperature in any given month has similarly risen by 1 to 2 degrees Celsius over the few decades. March and April, Bangalore's hottest months, are only getting hotter. 5 Key Research Findings Over the last 20 years, the temperatures went beyond 36.5 degrees Celsius on over nine occasions, as opposed to only four such years in the two preceding decades starting 1967. Rains in Bangalore have also turned unpredictable. The months of September &October are when the city receives the highest rainfall in the year, about 195 mm and 180 mm respectively on an average. However in recent years Bangalore received only approximately 45.3 mm rain in September. 6 Key Research Findings Bangalore-The Urban Heat Island The Centre's recording stations are placed in two different locations in the city, one in the centre and the other near the airport. The readings of these two thermometers are always 1 or 2 degrees different, with the one in the city centre recording higher temperatures consistently. This is a classic example of the "urban heat island" effect, caused because Bangalore's green cover is being replaced by concrete structures that absorb solar radiation very rapidly. Vehicular pollution, with carbon dioxide and other green house gases that it generates, also has a big role to play. Approximately 1.5 lakh to two lakh vehicles are added to the city roads every year. Carbon dioxide emissions trap heat, and this impacts climate. 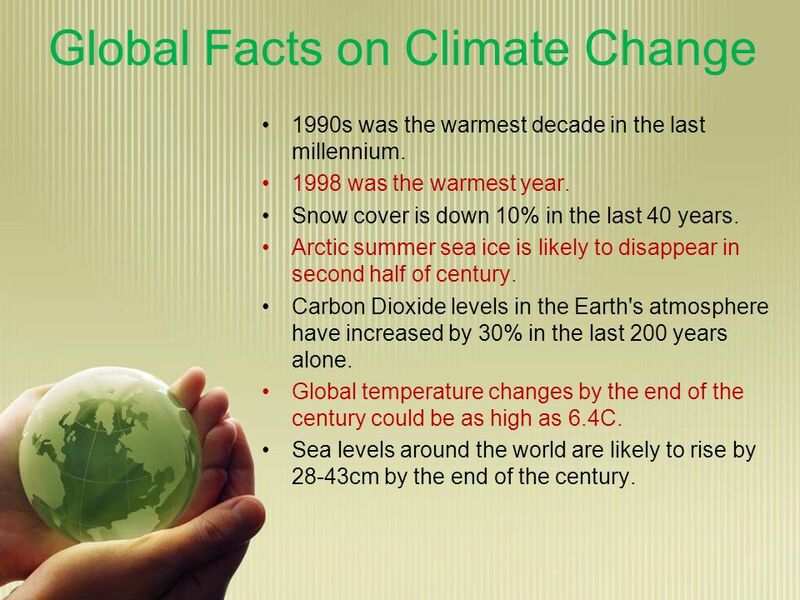 7 Global Facts on Climate Change 1990s was the warmest decade in the last millennium. 1998 was the warmest year. Snow cover is down 10% in the last 40 years. Arctic summer sea ice is likely to disappear in second half of century. Carbon Dioxide levels in the Earth's atmosphere have increased by 30% in the last 200 years alone. Global temperature changes by the end of the century could be as high as 6.4C. Sea levels around the world are likely to rise by 28-43cm by the end of the century. 8 Some negative effects of Climate Change In Asia alone more than a billion people will be affected by water shortage by 2050. Changes to India's annual monsoon are expected to result in severe droughts and intense flooding in parts of India. With more than 60% of agriculture dependent on rain- fed crops, even modest alteration in the intensity, frequency and timing of rainfall should cause a large negative impact on food production. Increase in water borne diseases such as cholera and hepatitis, as well as diseases carried by insects such as malaria. Climate change is expected to contribute to air quality problems and respiratory disorders will increase due to warming-induced increases in the frequency of smog. 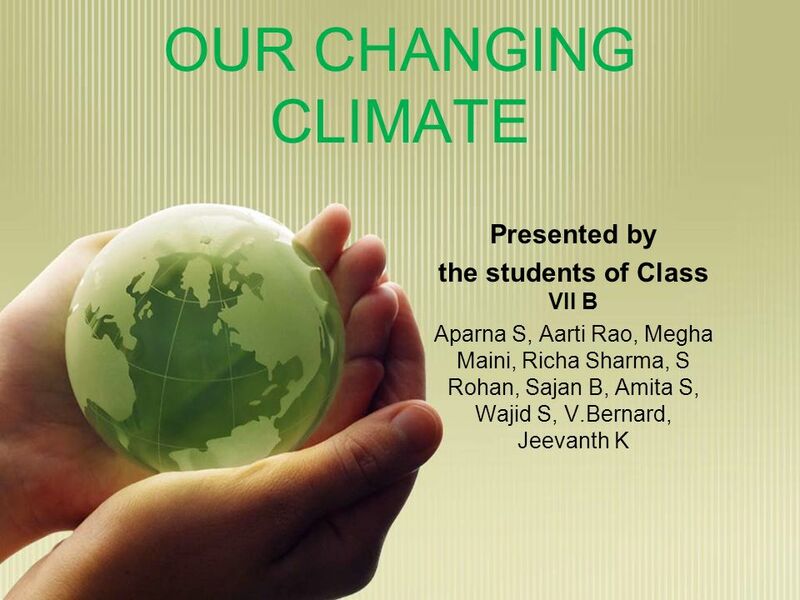 Download ppt "OUR CHANGING CLIMATE Presented by the students of Class VII B Aparna S, Aarti Rao, Megha Maini, Richa Sharma, S Rohan, Sajan B, Amita S, Wajid S, V.Bernard,"
Ch Climate Climatology – the study of Earth’s climate and the factors that affect past, present, and future climatic changes. Climate is the long-term. 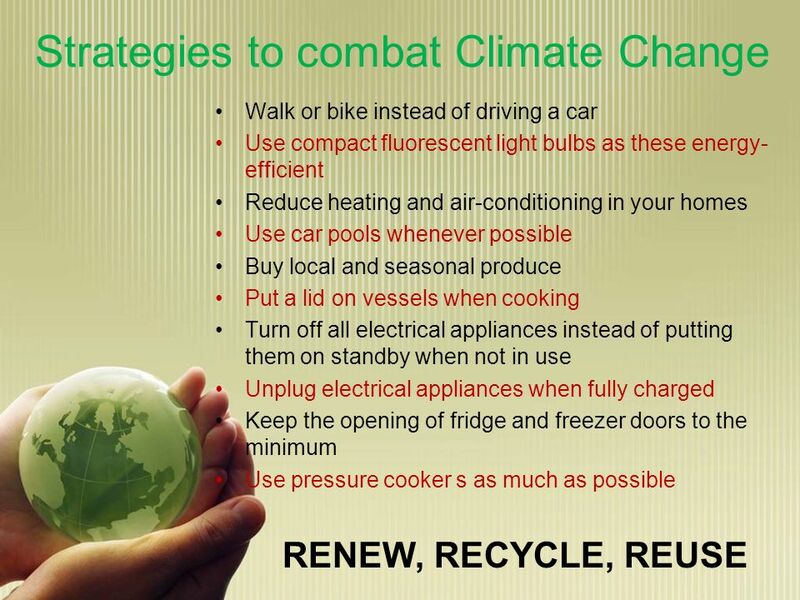 What can we do to reduce global warming? Qidao Wang. MITIGATING CLIMATE CHANGE. WHAT WE KNOW The level of greenhouse gases in the atmosphere have increased, causing the Earth’s temperature to rise. One greenhouse. Global Warming By: Tristen King. By Evan Hsu. 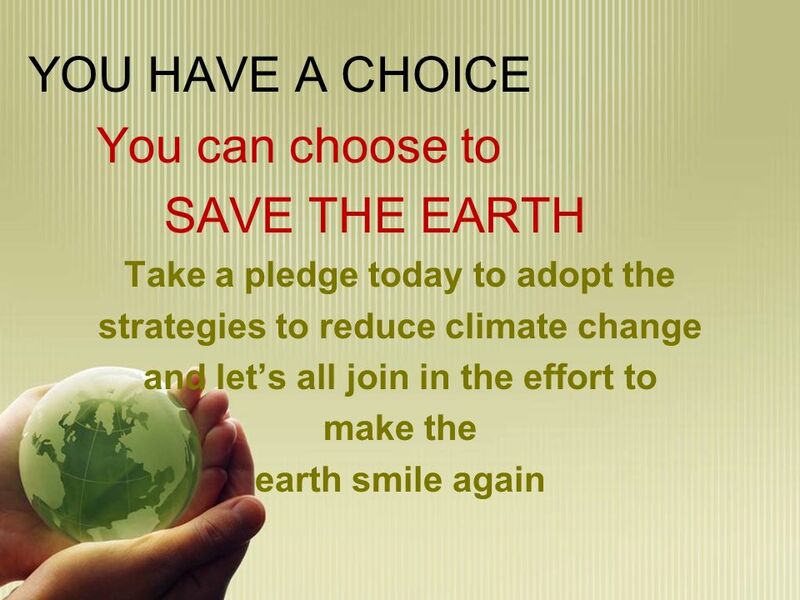  Global warming is the average temperature increase of Earth’s air and oceans.  Currently, it is still a theory.  Some people do not believe. Global Warming How does global warming affect places like the tundra? Low Carbon Council → Low Carbon Gwynedd By Marial Edwards SAVING ENERGY. Global Warming What Is It?. Green house effect is an important natural process. Without it, the Earth would be too cool for the survival of living organisms. Carbon dioxide is the.